Corporate data protection is an important factor for the success of any business. Trust among your employees, business partners, and customers depends on the security of your data. 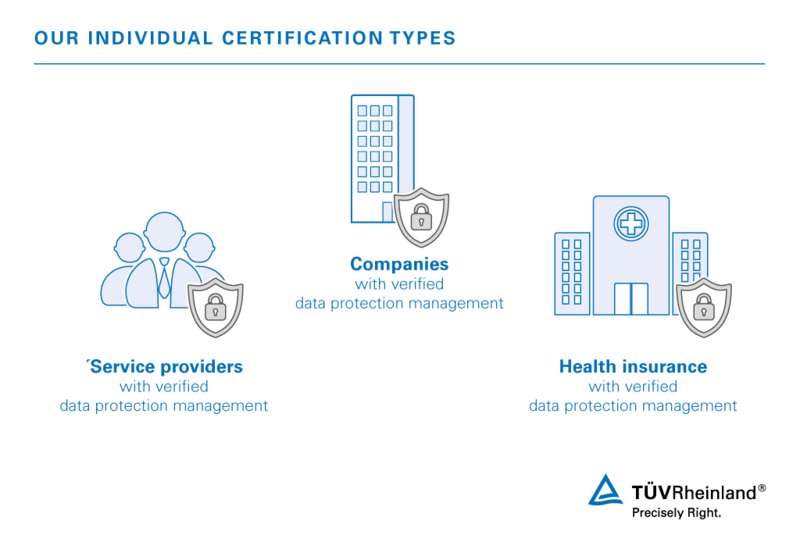 By conducting a data protection audit and subsequent data protection certification for your business, you demonstrate that personal data receives excellent security and privacy treatment at your company. Our experts help you throughout the entire process, from an initial briefing interview to final certification for your corporate data protection. The relevant data protection review is performed based on legal requirements, including the actual, applicable European Data Protection Laws and Regulations, as well as the ISO 27001 and ISO 18028 safety standards. Thanks to our extensive experience and comprehensive expertise in matters of data protection, we are the right partner by your side. Our recognized and independent specialists provide personal and professional assistance, from initial review to certification. Contact us and find out how you can optimize protection for personal data at your business . A data protection audit from our experts demonstrates that data protection is important to you, and that your organization complies with legal requirements and regulations such as the actual, applicable European Data Protection Laws and Regulations. Establish additional transparency through the creation of a binding catalog of criteria and procedures. We help you improve the quality of your data protection. Our specialists share their extensive expertise with your internal data protection officer and thereby help you maintain a high level of data protection. Use our data protection audit and data protection certificate to prove and document that personal data are collected and handled appropriately by your business. Based on legal requirements such as the actual, applicable European Data Protection Laws and Regulations and international safety standards such as ISO 27001, ISO 27002 and ISO 18028, our experts have developed a modular procedure that can be deployed individually. During a preparation meeting, our experts discuss how the certification will proceed before creating an individual audit plan. General data protection: Our experts will meet with your company's data protection officer to evaluate the principles of data protection that have been implemented. Departments: Our experts assess the processes within your departments, from HR to sales and marketing, in terms of data protection requirements. Environmental safety: Our experts inspect your building and computer/server rooms to examine access options and physical data protection. Order data processing: Our experts examine your service contracts to assess legal requirements and identify potential external gaps in your privacy and security. Software check: Our experts examine the software you use to collect and process personal data. Online check: Does your website contain the legally required information? Among other things, our experts check whether it offers a data protection declaration and any other necessary information. At the end of the data protection audit you will receive a preliminary summary of results. Our experts draw up their audit report based on the analysis conducted during this audit. Once you have passed the audit, your company will be certified as having a data protection management system that goes beyond legal requirements. This demonstrates that you care about data protection. By choosing us you are calling on an independent and respected testing organization. Thanks to our experience and knowledge in the field of corporate data protection we can provide optimal support for you. This will considerably improve trust in your company, not only among employees but also among customers and business partners. We help businesses with corporate data protection. Ask our experts now.